"Unified Canadian Aboriginal Syllabics" redirects here. For the Unicode block, see Unified Canadian Aboriginal Syllabics (Unicode block). Canadian Aboriginal syllabic writing, or simply syllabics, is a family of abugidas (writing systems based on consonant-vowel pairs) used to write a number of indigenous Canadian languages of the Algonquian, Inuit, and (formerly) Athabaskan language families. They are valued for their distinctiveness from the Latin script of the dominant languages and for the ease with which literacy can be achieved; indeed, by the late 19th century the Cree had achieved what may have been one of the highest rates of literacy in the world. Canadian syllabics are currently used to write all of the Cree languages from Naskapi (spoken in Quebec) to the Rocky Mountains, including Eastern Cree, Woods Cree, Swampy Cree and Plains Cree. They are also used to write Inuktitut in the eastern Canadian Arctic; there they are co-official with the Latin script in the territory of Nunavut. They are used regionally for the other large Canadian Algonquian language, Ojibwe, as well as for Blackfoot, where they are obsolete. Among the Athabaskan languages further to the west, syllabics have been used at one point or another to write Dakelh (Carrier), Chipewyan, Slavey, Tłı̨chǫ (Dogrib) and Dane-zaa (Beaver). Syllabics have occasionally been used in the United States by communities that straddle the border, but are principally a Canadian phenomenon. Canadian "syllabic" scripts are not syllabaries, in which every consonant–vowel sequence has a separate glyph, but abugidas, in which consonants are modified in order to indicate an associated vowel—in this case through a change in orientation, which is unique to Canadian syllabics. In Cree, for example, the consonant p has the shape of a chevron. In an upward orientation, ᐱ, it transcribes the syllable pi. Inverted, so that it points downwards, ᐯ, it transcribes pe. Pointing to the left, ᐸ, it is pa, and to the right, ᐳ, po. The consonant forms and the vowels so represented vary from language to language, but generally approximate their Cree origins. Evans' script, as published in 1841. Long vowels were indicated by breaking the characters. The length distinction was not needed in the case of e, as Cree has only long ē. ^ The obsolete sp- series, which is not supported by Unicode, is here represented by Latin and Cyrillic letters. The clockwise 90° rotation relates vowels as the later series sh- does, but unlike later Inuktitut consonants. Because the script is presented in syllabic charts and learned as a syllabary, it is often considered to be such. Indeed, computer fonts have separate coding points for each syllable (each orientation of each consonant), and the Unicode Consortium considers syllabics to be a "featural syllabary" along with such scripts as hangul, where each block represents a syllable, but consonants and vowels are indicated independently (in Cree syllabics, the consonant by the shape of a glyph, and the vowel by its orientation). This is unlike a true syllabary, where each combination of consonant and vowel has an independent form that is unrelated to other syllables with the same consonant or vowel. The original script, which was designed for Swampy Cree, had ten such letter forms: Eight for syllables based on the consonants p-, t-, c-, k-, m-, n-, s-, y- (pronounced /p, t, ts, k, m, n, s, j/), another for vowel-initial syllables, and finally a blended form, now obsolete, for the consonant cluster sp-. All were written with a light line to show the vowel was short and a heavier line to show the vowel was long: ᑲ ka, ᑲ kâ. (A hand-written variant, a superscript dot for vowel length, is now used in printing as well.) One consonant, w, had no letter form of its own but was indicated by a diacritic on another syllable; this is because it could combine with any of the consonants, as in ᑿ kwa, as well as existing on its own, as in ᐘ wa. The orientation of a perfectly symmetrical vowel triangle may be difficult to discern. In the type of this Ojibwe sign, left-pointing a is an isosceles right-angled triangle, but upright i is acute-angled and isosceles. The vowels fall into two sets, the back vowels -a and -o, and the front vowels -e and -i. Each set consists of a lower vowel, -a or -e, and a higher vowel, -o or -i. In all cases, back-vowel syllables are related through left-right reflection: that is, they are mirror images of each other. How they relate to front-vowel syllables depends on the graphic form of the consonants. These follow two patterns. Symmetrical, vowel, p-, t-, sp-, are rotated 90 degrees (a quarter turn) counter-clockwise, while those that are asymmetrical top-to-bottom, c-, k-, m-, n-, s-, y-, are rotated 180 degrees (a half turn). The lower front-vowel (-e) syllables are derived this way from the low back-vowel (a) syllables, and the high front-vowel (-i) syllables are derived this way from the higher back-vowel (-o) syllables. These forms are present in most syllabics scripts with sounds values that approach their Swampy Cree origins. For example, all scripts except the one for Blackfoot use the triangle for vowel-initial syllables. By 1841, when Evans cast the first movable type for syllabics, he found that he could not satisfactorily maintain the distinction between light and heavy typeface for short and long vowels. He instead filed across the raised lines of the type, leaving gaps in the printed letter for long vowels. This can be seen in early printings. Later still a dot diacritic, originally used for vowel length only in handwriting, was extended to print: Thus today ᐊ a contrasts with ᐋ â, and ᒥ mi contrasts with ᒦ mî. Although Cree ê only occurs long, the script made length distinctions for all four vowels. Not all writers then or now indicate length, or do not do so consistently; since there is no contrast, no one today writes ê as a long vowel. Reflecting the shorthand principles on which it was based, syllabics may be written plain, indicating only the basic consonant–vowel outline of speech, or pointed, with diacritics for vowel length and the consonants /w/ and /h/. Full phonemic pointing is rare. Syllabics may also be written without word division, as Devanagari once was, or with spaces or dots between words or prefixes. The only punctuation found in many texts is spacing between words and ᙮ for a full stop. Punctuation from the Latin script, including the period (. ), may also be used. Due to the final c resembling a hyphen, a double hyphen ⟨᐀⟩ is used as the Canadian Aboriginal syllabics hyphen. The full-sized characters, whether standing for consonant-vowel combinations or vowels alone, are usually called "syllables". They may be phonemic rather than morphophonemic syllables. That is, when one morpheme (word element) ends in a consonant and the next begins with a vowel, the intermediate consonant is written as a syllable with the following vowel. For example, the Plains Cree word pīhc-āyi-hk "indoors" has pīhc as its first morpheme, and āyi as its second, but is written ᐲᐦᒑᔨᕽ pīh-cā-yihk. In other cases, a "syllable" may in fact represent only a consonant, again due to the underlying structure of the language. In Plains Cree, ᑖᓂᓯ tānisi "hello" or "how are you?" is written as if it had three syllables. Because the first syllable has the stress and the syllable that follows has a short /i/, the vowel is dropped. As a result, the word is pronounced "tānsi" with only two syllables. Syllabication is important to determining stress in Algonquian languages, and vice versa, so this ambiguity in syllabics is relatively important in Algonquian languages. The word "series" is used for either a set of syllables with the same vowel, or a set with the same initial consonant. Thus the n-series is the set of syllables that begin with n, and the o-series is the set of syllables that have o as their vowel regardless of their initial consonant. A series of small raised letters are called "finals". They are usually placed after a syllable to indicate a final consonant, as the ᕽ -hk in ᔨᕽ yihk above. However, the Cree consonant h, which only has a final form, begins a small number of function words such as ᐦᐋᐤ hāw. In such cases the "final" ᐦ represents an initial consonant and therefore precedes the syllable. The use of diacritics to write consonants is unusual in abugidas. However, it also occurs (independently) in the Lepcha script. Finals are commonly employed in the extension of syllabics to languages it was not initially designed for. In some of the Athabaskan alphabets, finals have been extended to appear at mid height after a syllable, lowered after a syllable, and at mid height before a syllable. For example, Chipewyan and Slavey use the final ᐟ in the latter position to indicate the initial consonant dl (/ɮ/). In Naskapi, a small raised letter based on sa is used for consonant clusters that begin with /s/: ᔌ spwa, ᔍ stwa, ᔎ skwa, and ᔏ scwa. The Cree languages the script was initially designed for had no such clusters. In Inuktitut, something similar is used not to indicate sequences, but to represent additional consonants, rather as the digraphs ch, sh, th were used to extend the Latin letters c, s, t to represent additional consonants in English. In Inuktitut, a raised na-ga is placed before the g- series, ᖏ ᖑ ᖓ, to form an ng- (/ŋ/) series, and a raised ra (uvular /ʁ/) is placed before syllables of the k- series, ᕿ ᖁ ᖃ, to form a uvular q- series. Although the forms of these series have two parts, each is encoded into the Unicode standard as a single character. Other marks placed above or beside the syllable are called "diacritics". These include the dot placed above a syllable to mark a long vowel, as in ᒦ mî, and the dot placed at mid height after the syllable (in western Cree dialects) or before the syllable (in eastern Cree dialects) to indicate a medial w, as in ᑿ kwa. These are all encoded as single characters in Unicode. Diacritics used by other languages include a circle above, two dots before, and a variety of other marks. Such diacritics may or may not be separately encoded into Unicode. There is no systematic way to distinguish elements that are parts of syllables from diacritics, or diacritics from finals, and academic discussions of syllabics are often inconsistent in their terminology. The diacritic mark used to indicate vowel length is often referred to as a "point". Syllabics users do not always consistently mark vowel length, w, or h. A text with these marked is called a "pointed" text; one without such marks is said to be "unpointed". The word syllabary has two meanings: a writing system with a separate character for each syllable, but also a table of syllables, including any script arranged in a syllabic chart. Evans' Latin Ojibwe alphabet, for example, was presented as a syllabary. Canadian Aboriginal syllabics, the script itself, is thus distinct from a syllabary (syllabic chart) that displays them. Cree syllabics were created in a process that culminated in 1840 by James Evans, a missionary, and Mistanaskowew, a Cree (Badger Calling - from mistanask ᒥᐢᑕᓇᐢᐠ 'badger'). Missionary James Evans formalized them for Swampy Cree and Ojibwe. Evans had been inspired by the success of Sequoyah's Cherokee syllabary after encountering problems with Latin-based alphabets, and drew on his knowledge of Devanagari and shorthand. Canadian syllabics would influence the Pollard script in China. Other missionaries were reluctant to use it, but it was rapidly indigenized and spread to new communities before missionaries arrived. The Cree created a legend after 1840 that Canadian syllabics originated from Cree culture. In 1827, James Evans, a missionary from Kingston upon Hull, England, was placed in charge of the Wesleyan mission at Rice Lake, Ontario. Here, he began to learn the eastern Ojibwe language spoken in the area and was part of a committee to devise a Latin alphabet for it. By 1837 he had prepared the Speller and Interpreter in English and Indian, but was unable to get its printing sanctioned by the British and Foreign Bible Society. At the time, many missionary societies were opposed to the development of native literacy in their own languages, believing that their situation would be bettered by linguistic assimilation into colonial society. Evans continued to use his Ojibwe orthography in his work in Ontario. As was common at the time, the orthography called for hyphens between the syllables of words, giving written Ojibwe a partially syllabic structure. However, his students appear to have had conceptual difficulties using the same alphabet for two different languages with very different sounds, and Evans himself found this approach awkward. Furthermore, the Ojibwe language was polysynthetic but had few distinct syllables, meaning that most words had a large number of syllables; this made them quite long when written with the Latin script. He began to experiment with creating a more syllabic script that he thought might be less awkward for his students to use. In 1840, Evans was relocated to Norway House in northern Manitoba. Here he began learning the local Swampy Cree dialect. Like Ojibwe, to which it was quite closely related, it was full of long polysyllabic words. As an amateur linguist, Evans was acquainted with the Devanagari script used in British India; in Devanagari, each letter stands for a syllable, and is modified to represent the vowel of that syllable. Such a system, now called an abugida, readily lent itself to writing a language such as Swampy Cree, which had a simple syllable structure of only eight consonants and four long or short vowels. Evans was also familiar with British shorthand, presumably Samuel Taylor's Universal Stenography, from his days as a merchant in England; and now he acquired familiarity with the newly published Pitman shorthand of 1837. Both Devanagari and Pitman played a role in the development of Cree syllabics. Devanagari provided the glyphs for the syllables, whereas Pitman provided the glyphs for the final consonants, as well as the idea of rotation and line weight to modify the syllables. Because Cree consonants can be either voiced or voiceless, depending on their environment, each corresponds to two Devanagari letters, and Cree ka/ga, for example, resembles Devanagari g rather than k. Note also that h, which only occurs as a final in syllabics, appears to derive from the Devanagari visarga, ◌ः ḥ, which also occurs only as a final, rather than from syllabic ह ha. *Cursive स is more similar to ᓴ, looking rather like म m.
It is possible that -l and -r were derived through rotation from one Devanagari glyph, in the spirit of Pitman, where l and r are related in this way, rather than from the two different glyphs suggested by the table. In contrast, the final consonants p t c k m n s and y (which Evans called "final i"), which are now only used for Western Cree, derive from Pitman shorthand. The linear glyphs ᑊ ᐟ ᐨ ᐠ p t c k are rotated 45° from Pitman ᐠ ᑊ ᐟ ᐨ p t c k, but keep their relative orientations intact; the lunate glyphs ᒼ ᐣ ᐢ m n s are rotated 90° from Pitman ᐢ ᓑ ᐣ m n s. The Cree "final i" was originally a dot, as was the diacritic for the vowel i in Pitman. The final hk, however, is ᕽ, a small version of the Greek letter Χ kh, chosen because Χ is a logogram for Christ. The use of rotation to change the vowel of a syllable is unique to Canadian syllabics, but had its antecedent in shorthand. Pitman used rotation to change place of articulation: plosives p t ch k, nasals m n, and fricatives h s sh f th were all related through rotation, as can be partially seen in the table of finals above. Initially, Evans indicated vowel length with light versus heavy lines (the feature used to indicate voicing in Pitman); but this proved awkward in print, and by 1841 it was changed to broken lines for long vowels versus solid lines for short vowels. Later Evans introduced the current practice of writing a dot above the syllable to indicate vowel length. The local Cree community quickly took to this new writing system. Cree people began to use it to write messages on tree bark using burnt sticks, leaving messages out on hunting trails far from the mission. Evans believed that it was well adapted to Native Canadian languages, particularly the Algonquian languages with which he was familiar. He claimed that "with some slight alterations" it could be used to write "every language from the Atlantic to the Rocky Mountains." Evans attempted to secure a printing press and new type to publish materials in this writing system. Here, he began to face resistance from colonial and European authorities. The Hudson's Bay Company, which had a monopoly on foreign commerce in western Canada, refused to import a press for him, believing that native literacy was something to be discouraged. Evans, with immense difficulty, constructed his own press and type and began publishing in syllabics. Evans left Canada in 1846 and died shortly thereafter. However, the ease and utility of syllabic writing ensured its continued survival, despite European resistance to supporting it. In 1849, the Anglican bishop of Rupert's Land reported that "a few of the Indians can read by means of these syllabic characters; but if they had only been taught to read their own language in our letters, it would have been one step towards the acquisition of the English tongue." But syllabics had taken root among the Cree (indeed, their rate of literacy was greater than that of English and French Canadians), and in 1861, fifteen years after Evans had died, the British and Foreign Bible Society published a Bible in Cree syllabics. By then, both Protestant and Catholic missionaries were using and actively propagating syllabic writing. Missionary work in the 1850s and 1860s spread syllabics to western Canadian Ojibwe dialects (Plains Ojibwe and Saulteaux), but it was not often used over the border by Ojibwe in the United States. Missionaries who had learned Evans' system spread it east across Ontario and into Quebec, reaching all Cree language areas as far east as the Naskapi. Attikamekw, Montagnais and Innu people in eastern Quebec and Labrador use Latin alphabets. 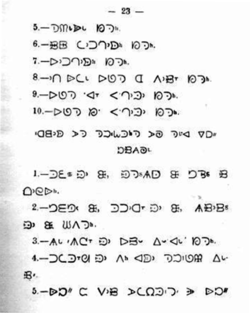 In 1856, John Horden, an Anglican missionary at Moose Factory, Ontario, who adapted syllabics to the local James Bay Cree dialect, met a group of Inuit from the region of Grande Rivière de la Baleine in northern Quebec. They were very interested in adapting Cree syllabics to their language. He prepared a few based on their pronunciation of Inuktitut, but it quickly became obvious that the number of basic sounds and the simple model of the syllable in the Evans system was inadequate to the language. With the assistance of Edwin Arthur Watkins, he dramatically modified syllabics to reflect these needs. In 1876, the Anglican church hired Edmund Peck to work full-time in their mission at Great Whale River, teaching syllabics to the Inuit and translating materials into syllabics. His work across the Arctic is usually credited with the establishment of syllabics among the Inuit. With the support of both Anglican and Catholic missionary societies, by the beginning of the 20th century the Inuit were propagating syllabics themselves. In the 1880s, John William Tims, an Anglican missionary from Great Britain, invented a number of new forms to write the Blackfoot language. French Roman Catholic missionaries were the primary force for expanding syllabics to Athabaskan languages in the late 19th century. The Oblate missionary order was particularly active in using syllabics in missionary work. Oblate father Adrien-Gabriel Morice adapted syllabics to Dakelh, inventing a large number of new basic characters to support the radically more complicated phonetics of Athabaskan languages. Father Émile Petitot developed syllabic scripts for many of the Athabaskan languages of the Northwest Territories, including Slavey and Chipewyan. Cree influenced the design of the Pollard script in China. The inventory, form, and orthography of the script vary among all the Cree communities which use it. However, it was further modified to create specific alphabets for other Algonquian languages, as well as for Inuit, which have significant phonological differences from Cree. There are two major variants of the script, Central Algonquian and Inuktitut. In addition, derivative scripts for Blackfoot and Athabaskan inherit at least some principals and letter forms from the Central Algonquian alphabet, though in Blackfoot most of the letters have been replaced with modified Latin. Each reflects a historical expansion of the writing system. Cree and Ojibwe were the languages for which syllabics were designed, and they are the closest to the original pattern described by James Evans. The dialects differ slightly in their consonants, but where they share a sound, they generally use the same letter for it. Where they do not, a new letter was created, often by modifying another. In several Cree dialects ê has merged with the î, and these use only three of the four vowel orientations. When syllabics spread to Ojibwe and to those Cree dialects east of the Manitoba-Ontario border, a few changes occurred. For one, the diacritic used to mark non-final w moved from its position after the syllable to before it; thus western Cree ⟨ᒷ⟩ is equivalent to the eastern Cree ⟨ᒶ⟩ – both are pronounced mwa. Secondly, the special final forms of the consonants were replaced with superscript variants of the corresponding a series, so that ⟨ᐊᒃ⟩ is ak and ⟨ᓴᑉ⟩ sap (graphically "aka" and "sapa"), rather than ⟨ᐊᐠ⟩ and ⟨ᓴᑊ⟩. Cree dialects of the western provinces preserve the Pitman-derived finals of the original script, though final y has become the more salient ⟨ᐩ⟩, to avoid confusion with the various dot diacritics. Additional consonant series are more pervasive in the east. A few western charts show full l- and r- series, used principally for loan words. In a Roman Catholic variant, r- is a normal asymmetric form, derived by adding a stroke to c-, but l- shows an irregular pattern: Despite being asymmetrical, the forms are rotated only 90°, and li is a mirror image of what would be expected; it is neither an inversion nor a reflection of le, as in the other series, but rather a 180° rotation. There are minor variants within both eastern and western Cree. Woods Cree, for example, uses western Cree conventions, but has lost the e series, and has an additional consonant series, ⟨ᙾ⟩ th- (ð-), which is a barred form of the y- series. Moose Cree, which uses eastern Cree conventions, has an -sk final that is composed of -s and -k, as in ᐊᒥᔉ amisk "beaver", and final -y is written with a superscript ring, ⟨°⟩, rather than a superscript ya, which preserves, in a more salient form, the distinct final form otherwise found only in the west: ᐋᔕ̊ āshay "now". The Eastern Cree dialect has distinct labialized finals, ⟨ᒄ⟩ -kw and ⟨ᒽ⟩ -mw; these are written with raised versions of the o-series rather than the usual a-series, as in ᒥᔅᑎᒄ mistikw "tree". This is motivated by the fact that the vowel o labializes the preceding consonant. Although in most respects Naskapi follows eastern Cree conventions, it does not mark vowel length at all and uses two dots, either placed above or before a syllable, to indicate a w: ⟨ᐛ⟩ wa, ⟨ᐖ⟩ wo, ⟨ᑥ⟩ twa, ⟨ᒂ⟩ kwa, ⟨ᒠ⟩ cwa (/tswa/), ⟨ᒺ⟩ mwa, ⟨ᓏ⟩ nwa, ⟨ᔄ⟩ swa, ⟨ᔽ⟩ ywa. Since Naskapi s- consonant clusters are all labialized, sCw-, these also have the two dots: ⟨ᔌ⟩ spwa, etc. There is also a labialized final sequence, ⟨ᔊ⟩ -skw, which is a raised so-ko. The eastern form of Cree syllabics was adapted to write the Inuktitut dialects of Nunavut (except for the extreme west, including Kugluktuk and Cambridge Bay) and Nunavik in northern Quebec. In other Inuit areas, various Latin alphabets are used. Inuktitut has only three vowels, and thus only needs the a-, i-, and o-series of Cree, the latter used for /u/. The e-series was originally used for the common diphthong /ai/, but this was officially dropped in the 1960s so that Inuktitut would not have more characters than could be moulded onto an IBM Selectric typewriter ball, with -ai written as an a-series syllable followed by ⟨ᐃ⟩ i. Recently the Inuit Tapiriit Kanatami decided to restore the ai-series, and the Makivik Corporation has adopted this use in Nunavik; it has not been restored in Nunavut. The remaining sounds are written with digraphs. A raised ra is prefixed to the k-series to create a digraph for q: ⟨ᖃ⟩ qa, etc. ; the final is ⟨ᖅ⟩ -q. A raised na-ga is prefixed to the g-series to create an ng (/ŋ/) series: ⟨ᖓ⟩ nga, etc., and the na is doubled for geminate nng (/ŋː/): ⟨ᙵ⟩ nnga. The finals are ⟨ᖕ⟩ and ⟨ᖖ⟩. In Nunavut, the h final has been replaced with Roman ⟨ᕼ⟩, which does not rotate, but in Nunavik a new series is derived by adding a stroke to the k-series: ⟨ᕹ⟩ ha, etc. In the early years, Roman Catholic and Anglican missionaries used slightly different forms of syllabics for Inuktitut. In modern times, however, these differences have disappeared. Dialectical variation across the syllabics-using part of the Inuit world has promoted an implicit diversity in spelling, but for the most part this has not had any impact on syllabics itself. At least two scripts derive from Cree syllabics, and share its principles, but have fundamentally different letter shapes or sound values. 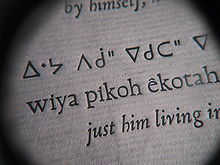 Blackfoot, another Algonquian language, uses a syllabary that is quite different from the Cree and Inuktitut versions. Although borrowing from Cree the ideas of rotated and mirrored glyphs with final variants, most of the letter forms derive from the Latin script, with only some resembling Cree letters. Blackfoot has eight initial consonants, only two of which are identical in form to their Cree equivalents, ⟨ᓯ⟩ se and ⟨ᔨ⟩ ye (here only the vowels have changed). The other consonants were created by modifying letters of the Latin script to make the e series, or in three cases by taking Cree letters but reassigning them with new sound values according to which Latin letters they resembled. These are ⟨ᑭ⟩ pe (from ⟨P⟩), ⟨ᒥ⟩ te (from ⟨T⟩), ⟨ᖼ⟩ ke (from ⟨K⟩), ⟨ᒋ⟩ me (from ⟨m⟩), ⟨ᖸ⟩ ne (from ⟨N⟩), ⟨ᖴ⟩ we (from ⟨Ϝ⟩). There are also a number of distinct final forms. The four vowel positions are used for the three vowels and one of the diphthongs of Blackfoot. The script is now obsolescent. Athabaskan syllabic scripts were developed in the late 19th century by French Roman Catholic missionaries, who adapted this originally Protestant writing system to languages radically different from the Algonquian languages. Most Athabaskan languages have more than four distinct vowels, and all have many more distinct consonants than Cree. This has meant the invention of a number of new consonant forms. Whereas most Athabaskan scripts, such as those for Slavey and Chipewyan, bear a reasonably close resemblance to Cree syllabics, the Carrier (Dakelh) variant is highly divergent, and only one series – the series for vowels alone – resembles the original Cree form. To accommodate six distinctive vowels, Dakelh supplements the four vowel orientations with a dot and a horizontal line in the rightward pointing forms: ᐊ a, ᐅ ʌ, ᐈ e, ᐉ i, ᐃ o, and ᐁ u. Other series are formed from dh or t. A mid-line final Cree t preceding dh forms th, a raised Cree final p following t forms tt, a stroke inside t forms tth (ᕮ ttha), and a small t inside t forms ty (ᕳ tya). Nasal vowels are indicated by a following Cree final k.
All Athabaskan syllabic scripts are now obsolescent. The Pollard script, also known as Pollard Miao is an abugida invented by Methodist missionary Samuel Pollard. Pollard credited the basic idea of the script to the Cree syllabics, saying, "While working out the problem, we remembered the case of the syllabics used by a Methodist missionary among the Indians of North America, and resolved to do as he had done". At present, Canadian syllabics seems reasonably secure within the Cree, Oji-Cree, and Inuit communities, somewhat more at risk among the Ojibwe, seriously endangered for Athabaskan languages and Blackfoot. In Nunavut and Nunavik, Inuktitut syllabics have official status. 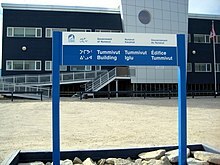 In Nunavut, laws, legislative debates and many other government documents must be published in Inuktitut in both syllabics and the Latin script. The rapid growth in the scope and quantity of material published in syllabics has, by all appearances, ended any immediate prospect of marginalisation for this writing system. Within the Cree and Ojibwe language communities, the situation is less confident. Cree syllabics use is vigorous in most communities where it has taken root. In many dialect areas, there are now standardised syllabics spellings. Nonetheless, there are now linguistically adequate standardised Roman writing systems for most if not all dialects. Ojibwe speakers in the US have never been heavy users of either Canadian Aboriginal syllabics or the Great Lakes Aboriginal syllabics and have now essentially ceased to use either of them at all. The "double vowel" Roman orthography developed by Charles Fiero and further developed by John Nichols is increasingly the standard in the USA and is beginning to penetrate into Canada, in part to prevent further atomisation of what is already a minority language. Nonetheless, Ojibwe syllabics are still in vigorous use in some parts of Canada. Use in other communities is moribund. Blackfoot syllabics have, for all intents and purposes, disappeared. Present day Blackfoot speakers use a Latin alphabet, and very few Blackfoot can still read—much less write—the syllabic system. Among the Athabaskan languages, no syllabics script is in vigorous use. In some cases, the languages themselves are on the brink of extinction. In other cases, syllabics has been replaced by a Latin alphabet. Many people—linguists and speakers of Athabaskan languages alike—feel that syllabics is ill-suited to these languages. The government of the Northwest Territories does not use syllabic writing for any of the Athabaskan languages on its territory, and native churches have generally stopped using them as well. Among Dakelh users, a well-developed Latin alphabet has effectively replaced syllabics, which are now understood almost exclusively by elderly members of the community. In the past, government policy towards syllabics has varied from indifference to open hostility. Until quite recently[when? ], government policy in Canada openly undermined native languages, and church organisations were often the only organised bodies using syllabics. Later, as governments became more accommodating of native languages, and in some cases even encouraged their use, it was widely believed that moving to a Latin alphabet was better, both for linguistic reasons and to reduce the cost of supporting multiple scripts. At present, at least for Inuktitut and Algonquian languages, Canadian government tolerates, and in some cases encourages, the use of syllabics. The growth of Aboriginal nationalism in Canada and the devolution of many government activities to native communities has changed attitudes towards syllabics. In many places there are now standardisation bodies for syllabic spelling, and the Unicode standard supports a fairly complete set of Canadian syllabic characters for digital exchange. Syllabics are now taught in schools in Inuktitut-speaking areas, and are often taught in traditionally syllabics-using Cree and Ojibwe communities as well. Although syllabic writing is not always practical (on the Internet, for example), and in many cases a Latin alphabet would be less costly to use, many native communities are strongly attached to syllabics. Even though it was originally the invention of European missionaries, many people consider syllabics a writing system that belongs to them, and associate Latin letters to linguistic assimilation. These characters can be rendered with any appropriate font, including the freely available fonts listed below. ^ Rogers, Henry (2005). Writing systems: a linguistic approach. Blackwell publishing. p. 249. ISBN 0-631-23463-2. Reports from the late nineteenth century say that virtually every adult Cree speaker was literate; even allowing for some exaggeration, Cree may have had one of the highest literacy rates in the world at the time. ^ For example, in a true syllabary pi would have no graphic connection to pa.
^ Bernard Comrie, 2005, "Writing Systems", in Haspelmath et al. eds, The World Atlas of Language Structures (p 568 ff). Also Robert Bringhurst, 2004, The solid form of language: an essay on writing and meaning. Comrie and Bringhurst use the term alphasyllabic, but the terms are essentially synonymous. ^ Symmetrical forms are those for which rotating the a or o series by 180° and a mirror-image reflection produce the same result, so that some other transformation is required to produce additional orientations. ^ For the asymmetrical forms in Evans' original system, this is equivalent to inverting (flipping upside down) the -a syllables to get the -i syllables, and the -o syllables to get the -e syllables; and for the symmetric forms, rotating 90 degrees clockwise for the same vowel correspondences. That appears to be how Evans designed the script, but this algorithm does not work for consonants added later on when syllabics was adapted for other Cree dialects or for other languages such as Inuktitut. ^ Stevenson, Winona (1999–2000). "Calling Badger and the Symbols of the Spirit Language: The Cree Origins of the Syllabic System". Oral History Forum. 19-20: 19–24. ^ "Rossville, 1840". www.tiro.com. Tiro Typeworks. Retrieved 2017-01-07. ^ Joakim Enwall (1994) A Myth Become Reality: History and Development of the Miao Written Language. Wikimedia Commons has media related to Canadian Aboriginal syllabics. This page was last edited on 21 April 2019, at 23:42 (UTC).